How failing charter schools are reincarnating as private schools. Converting into private schools—and using voucher programs to thrive on the public dime. Nearly all current students at Dixon receive the tax-credit vouchers, bringing the school more than $500,000 a year. This story was co-published with ProPublica. This past June, Florida’s top education agency delivered a failing grade to the Orange Park Performing Arts Academy in suburban Jacksonville for the second year in a row. It designated the charter school for kindergarten through fifth grade as the worst public school in Clay County and one of the lowest performing in the state. Two-thirds of the academy’s students failed the state exams last year, and only one-third of them were making any academic progress at all. The school had four principals in three years, and teacher turnover was high, too. The district terminated the academy’s charter contract. Surprisingly, Orange Park didn’t shut down—and even found a way to stay on the public dime. It reopened last month as a private school charging $5,000 a year, below the $5,886 maximum that low-income students receive to attend the school of their choice under a state voucher program. Academy officials expect all of its students to pay tuition with the publicly backed coupons. The Rev. Alesia Ford-Burse, an African Methodist Episcopal pastor who founded the academy, told ProPublica that the school deserves a second chance because families love its dance and art lessons, which they otherwise couldn’t afford. “Kids are saying, ‘F or not, we’re staying,’ ” she said. While it’s widely known that private schools convert to charter status to take advantage of public dollars, more schools are now heading in the opposite direction. As voucher programs across the country proliferate, shuttered charter schools like the Orange Park Performance Arts Academy have begun to privatize in order to stay open with state assistance. A ProPublica nationwide review found that at least 16 failing or struggling charter schools in five states—Florida, Wisconsin, Indiana, Ohio, and Georgia—have gone private with the help of publicly funded voucher programs, including 13 since 2010. Four of them specialize in the arts, including Orange Park, and five serve students with special needs. As private schools, the ex-charters are less accountable both to the government and the public. It can be nearly impossible to find out how well some of them are performing. About half of the voucher and voucher-like programs in the country require academic assessments of their students, but few states publish the complete test results or use that data to hold schools accountable. While most states have provisions for closing low-quality charter schools, few, if any, have the power to shut down low-performing voucher schools. The type of voucher program that rescues failed charter schools like Orange Park in Florida may soon be replicated nationwide. Visiting a religious school in Miami last April, Secretary of Education Betsy DeVos praised the state’s approach as a possible model for a federal initiative. Typically, voucher programs are directly funded with taxpayer dollars. Florida’s largest program pursues a different strategy. Its “tax-credit scholarships” are backed by donations from corporations. They contribute to nonprofit organizations which, in turn, distribute the money to the private schools. In exchange, the donors receive generous dollar-for-dollar tax credits from the state. This subsidy indirectly shifts hundreds of millions of dollars annually from the state’s coffers to private schools. More than 100,000 students whose families meet the income eligibility requirements have received the tax-credit coupons this year. Of the nearly 2,900 private schools in Florida, over 1,730 participated in the tax-credit voucher program during 2016–2017, according to the most recent state Department of Education data. On average, each school received about $300,000 last year. While more than two-thirds of these schools are religious, the roundabout funding approach protects the vouchers against legal challenges that they violate the separation of church and state. Earlier this year, the state Supreme Court dismissed a lawsuit by the Florida Education Association, a teachers union, challenging the constitutionality of the voucher program. In an education budget proposal from May, DeVos detailed her voucher plans, pitching a $250 million plan to study and expand individual state initiatives. She has since suggested that the administration may also create a federal tax-credit voucher scheme through an impending tax overhaul. School choice advocates like DeVos have long contended that vouchers improve educational opportunities for low-income families. They reason that competition raises school quality and that parents, given more options, will select the best school for their children. A growing body of research, though, casts doubt on this argument. It shows voucher-backed students may not be performing better than their public school counterparts—and may do worse. A recent U.S. Department of Education study compared students who attended private schools with vouchers in Washington, D.C., from 2012 through 2014 with those who qualified for the program but were turned down due to a lack of available slots. The private schoolers performed significantly worse than their public school peers in math and no better in reading. According to a February 2017 analysis by Martin Carnoy, a Stanford University education professor, most studies of voucher programs over the past quarter-century found little evidence that students who receive the coupons perform better than their public school peers. Across the Florida panhandle from Orange Park, another troubled charter school for the arts has reinvented itself as a voucher-funded private school. Founded in 2010, the A.A. Dixon Charter School of Excellence had the worst academic record in Escambia County, and the school board raised questions about its financial accounting. After Dixon received two failing grades from the state—which triggers termination of a school’s charter under Florida rules—the Rev. Lutimothy May, a Baptist pastor who chaired its board, appealed to state education authorities. They allowed the school to operate for at least one more year, but he began to seek other options. Around the same time, a local beverage distributor, David Bear of the Lewis Bear Company, told May that he was considering contributing to the state tax-credit program. 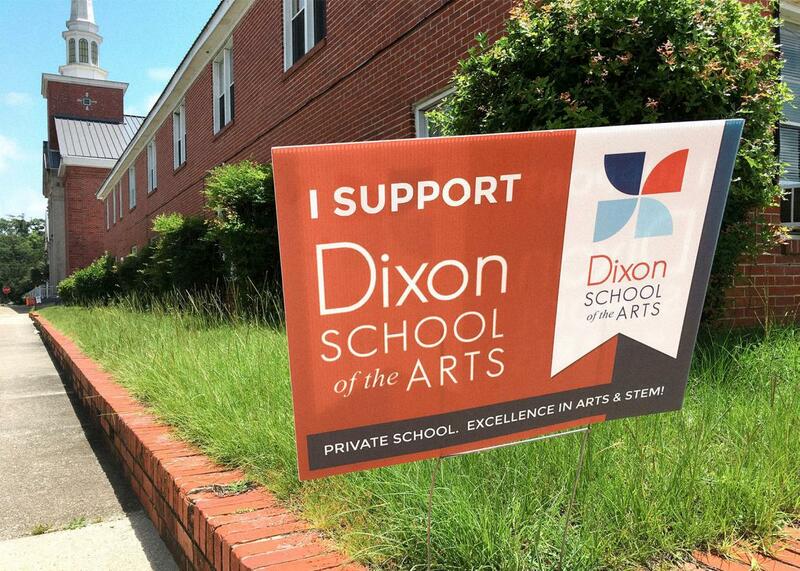 If the Dixon school privatized, Bear told May, donations could help save it. In 2013, May turned the charter, which had recently been renamed the Dixon School of the Arts, into a private Christian arts academy located inside his church. Nearly all current students at Dixon receive the tax-credit vouchers, bringing the school more than $500,000 a year, according to the most recent data from the state’s department of education. “Our goal is still the same,” but the conversion has “untied some of the strings on education,” May said. Some of the untied “strings” to which May referred were state educational requirements. By converting from a charter to private status, Dixon and other schools largely shield themselves from accountability. For instance, while Florida requires all private schools to test students who receive vouchers, the schools face no consequences for weak academic performance. The University of Florida publishes an annual report analyzing the test scores of students that receive vouchers, but data from only a small fraction of the schools is made public. The report excludes many schools that don’t have test results for enough students in consecutive years. The state also has little control over how private voucher-funded schools foster learning. There are no requirements on curriculum or teacher certification other than the criminal background checks that are required for personnel at all private schools. Because Dixon receives more than $250,000 in voucher money, it does have to file a financial accountability report. Only about 40 percent of all voucher-funded schools met this threshold to undergo such an audit in 2016. The reports, including Dixon’s, aren’t publicly posted. Even an official at Step Up For Students, the largest nonprofit distributor of voucher money to Florida’s private schools, acknowledges the need for closer supervision of educational quality. “As the program matures, and more students are enrolled, and as inevitably we see some schools continue to have what most people would consider to be poor performance year-in and year-out, we will be having more and more discussions about whether there should be some kind of regulatory accountability mechanisms to respond to that,” said Ron Matus, the organization’s director of policy and public affairs. Indiana’s largest voucher program, unlike Florida’s, is directly backed by taxpayer dollars and has stricter accountability requirements. A private school that accepts vouchers can be sanctioned if its performance dips low enough. Last year, 10 schools lost their access to new vouchers, according to Adam Baker, the spokesman for the Indiana Department of Education. The tighter supervision, though, didn’t deter Padua Academy in Indianapolis. Originally a private Catholic school, Padua had become a “purely secular“ charter in 2010 under an unusual arrangement between the local archdiocese and the mayor’s office. The school initially performed well, but soon sank from a solid A-rating to two consecutive F-ratings. “These performance issues sounded alarm bells at the mayor’s office,” said Brandon Brown, who led the mayor’s charter office at the time. Leadership issues with the school’s board and at the archdiocese, he added, caused the school to falter. After receiving $702,000 from a federal program that provided seed money for new charter schools, the school’s board relinquished its charter. In the meantime, Indiana had established a voucher program. So, instead of shutting down, the school rebranded itself as St. Anthony Catholic School, nailing its crucifixes back onto the walls and bringing the Bible back into the curriculum. Last year, more than 80 percent of its students were on vouchers, from which the school garnered at least $1.2 million. Its academic performance has improved but still lags behind the state average. Only 25 percent of St. Anthony students passed both math and reading assessments this year, versus about half of all publicly funded students on average at both private and public schools, according to the state’s education data from 2017. Last year, the state gave St. Anthony a “C” grade. In Fort Wayne, Indiana, two other charter schools went private. Both Imagine MASTer Academy and Imagine Schools on Broadway were associated with a national for-profit charter chain, Imagine Schools, which has been under scrutiny elsewhere. In 2012, the Missouri Board of Education shut down all six Imagine charter schools in St. Louis for financial and academic woes. In response to such setbacks, Imagine Schools has moved toward “an even deeper commitment to increasing the consistency of our network-wide performance,” said Rhonda Cagle, a spokeswoman for the chain. The two Fort Wayne schools performed well initially, but by the time their charters were up for renewal, they had some of the worst test results in the area, said Robert Marra, executive director of the charter office at Ball State University, which was responsible for the schools’ oversight. ImagineMASTer received a “D” grade, and Imagine Schools on Broadway an “F,” from the state in 2013. The data for the two schools “showed clear room for improvement but indicated consistent growth,” Cagle told ProPublica. In 2013, Imagine merged its two failing charters with a local parochial school, Horizon Christian Academy. Since then, the Christian academy’s enrollment has soared from 23 students to 492. About 430 students paid their tuition with the help of state vouchers last year, totaling about $2.4 million in public funds. While some of Imagine’s students and staff have stayed on, Cagle said that Imagine has no involvement in the merged academy other than owning the building. “We could have allowed the buildings to just be empty, but we felt like if there was an interest by another entity for the purposes of education, that would be doing the right thing,” she said. Imagine “does not utilize vouchers for any of our schools,” she added. Academically, Horizon Christian is far below average. Only 7 percent of its students passed both state exams this year, according to state data. One of its campuses received a “D” grade last year, and its other two campuses failed. The academy did not respond to questions. As it awaits its first infusion of voucher funds later this month, the Orange Park Performing Arts Academy is strapped. The district has repossessed most of the former charter school’s instructional supplies, including 200 Chromebooks, 34 laptops, 27 iPads, and hundreds of textbooks. The arts—the school’s core mission—have been cleaned out: 10 easels, nine digital pianos, eight heartwood djembes, and four conga drums, all gone. Once lined with silver bleachers, the walls of the cavernous gym are now bare. The school’s new principal, Kelly Kenney, isn’t deterred. She said that she has already made significant strides to separate the school from its failed days as a charter. Most of the teachers and administrators are new hires, although half of the teachers are uncertified. Kenney plans to get the school accredited and strengthen the board of directors. “It can’t be a board of friends,” she said. She has been working with each teacher individually to raise standards and improve curriculum. Even though it’s not required, Kenney intends to publish her students’ performance data on the school’s website. “It’s important for us to show how we did compared to last year,” she said. To recruit students this past summer, Kenney went door-to-door in nearby apartment complexes, hosting information sessions in laundry rooms. Believing that they couldn’t afford a private school, many families were reluctant to send their children to Orange Park—until Kenney told them about vouchers. For weeks, she and her staff have worked around the clock to sign up all the students in the voucher program, even helping them organize, fill out, and fax in the necessary paperwork. Bria Joyce is a loyalist. When her son started kindergarten at the local public school, she says he was “bumping heads” with classmates and she worried that he wasn’t receiving enough attention from teachers. She transferred him to the Orange Park charter school where he took piano lessons and played Grandpa Joe in a production of Charlie and the Chocolate Factory. When Joyce heard that the school was converting to a private school, she was nervous that she wouldn’t be able to afford the tuition. But the school reached out to her immediately and walked Joyce through the voucher process. Now Joyce’s son is starting fourth grade there.